Did you know that entire plumbing pipe runs do not need to be replaced if there is a crack, root infiltration or severe clog? Instead of replacing the entire pipe, a sectional point repair can be performed to remedy the problem. During a sectional point repair, the section of damaged pipe is identified and either removed or cleaned and lined with an epoxy liner. Here at Nu Flow in Chicago, we line damaged plumbing pipes to prevent future corrosion and to extend the pipe’s useful life. 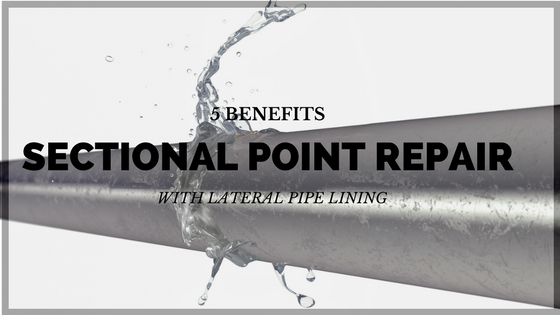 Using lateral pipe lining to perform a sectional point repair can save you time and money when it comes to fixing cracks, clogs and broken sections of pipe. This is because lateral point repairs can be performed trenchlessly with an epoxy liner, which means less digging and fewer man-hours. A sectional point repair only involves repairing the broken, leaking, clogged or bellied section of pipe. The sections of pipe that are still functioning correctly and in good condition are not repaired or replaced. This helps avoid unnecessary repairs and reduces the overall cost of the lateral pipe repair. Lateral pipe lining for sectional plumbing repairs ensures that the damaged pipe is completely restored while extending its expected useful life. This is because the pipe liner, once cured, performs as if it were an entirely new section of pipe. The liner also prevents future corrosion and pipe degradation in that section. Traditional lateral pipe repairs involve extensive digging in order to determine where the pipe is cracked, infiltrated with tree roots or partially collapsed. Trenchless pipe lining involves performing a camera inspection prior to any digging. In many instances, once the problem is found, our pipe lining technicians can access the nearest point of entry, like a cleanout access point, to insert the pipe liner. This means that we may not have to dig any access holes in your yard in order to reach the damaged section of pipe and repair it. With trenchless pipe lining, you will enjoy a faster repair and return to service. Many times the process can be completed within a single day, which gives you access to your drain lines much faster than with a traditional plumbing repair. Not to mention, you won’t have to spend a lot of time or money on correcting your landscaping and replacing grass. Epoxy pipe liners are completely waterproof. Once the epoxy liner has cured, wastewater will flow down the hardened liner instead of coming into contact with the host pipe. This prevents future corrosion, leaks and blowouts in the area that was repaired with the liner. Here at Nu Flow, our professional, experienced pipe lining technicians can perform sectional repairs on drain lines and potable water lines with epoxy pipe liners and epoxy coatings. Our process starts with a camera inspection to identify where the pipe is cracked, ruptured or clogged. Then, we determine how much of the pipe needs to be lined. Then we clean the pipe, insert the liner and wait for it to cure. Once the liner is cured, the pipe section is rehabilitated and fully waterproof. This type of repair will save you time and money compared to traditional pipe replacement. 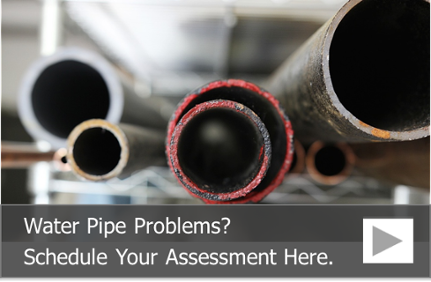 To learn more about lateral pipe lining or to schedule a building pipe assessment, call us at 815-790-9000.